When you do a set visit, you often sit around for hours waiting for the opportunity to do an interview. It’s no one’s fault that you have to wait, because most delays are a result of the actor being involved in the shot, so you sit around until they have some free time. 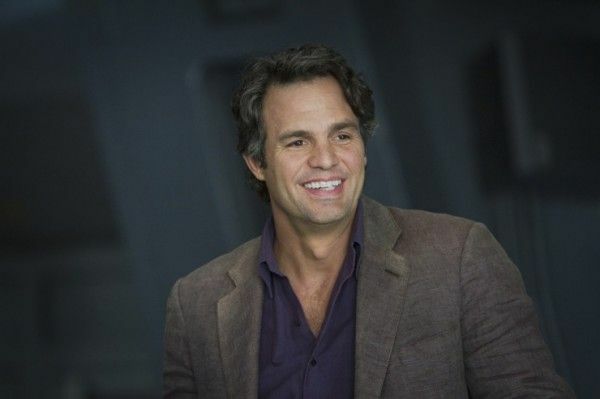 But when I visited the set of The Avengers last June with a few other reporters, as soon as we got out of the van, I turned my head and standing to our right was a very large man with long blond hair. As you’ve probably figured out, the large man was Chris Hemsworth and he proceeded to take the elevator with us upstairs and then sat down for an interview. During the wide ranging conversation, Hemsworth talked about where Thor is when the film begins, who he has the most scenes with, how the rest of The Avengers act around Thor and whether or not they’re intimidated, if he feels like The Avengers is a bigger movie than Thor, if Asgard plays a factor in the film, and so much more. Hit the jump to either read or listen to the interview. As usual, I’m offering two ways to get the interview: you can either click here for the audio or the full transcript is below. The Avengers opens May 4. Question: How long have you been filming and how’s it been going so far? CHRIS HEMSWORTH: It’s going good. We’ve been, trying to think now… a couple months. It’s going good. Really busy. Much different sort of schedule to Thor. For Thor, I was there every single day and it was all about Thor’s journey, whereas this is obviously an ensemble and much more spread. It’s been a different sort of work pattern, but I am still having fun. Where is Thor when we pick him up here? HEMSWORTH: We end Thor with him certainly matured from where he was in the beginning of the film and ready for that next stage of evolution of his character and journey. I am just now thinking, how much am I allowed to say? PUBLICIST: We can give the general gist of how they got to come together in the movie. HEMSWORTH: Thor is obviously here on earth now, because things are unsettled and … Am I allowed to talk about this? We could do this the whole time. 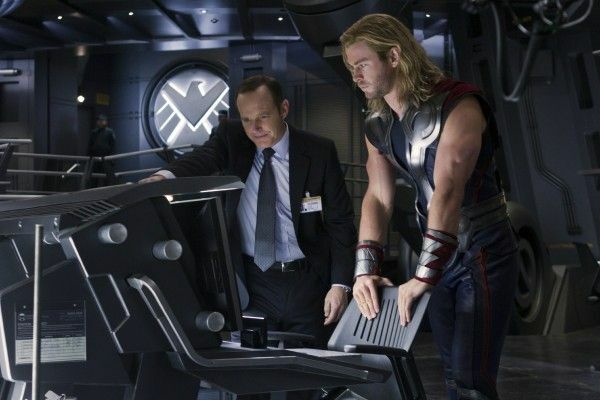 HEMSWORTH: He’s returned because his brother is involved in the chaos that’s happening on Earth, so there is some family business to take care of. Who do you play the majority of your scenes with? HEMSWORTH: It’s been pretty mixed. I probably have some bigger, intimate moments with Tom [Hiddleston], but the rest of my stuff is certainly the group together and the first couple of weeks. That was heavily the case when we first started shooting. It was a trippy sort of set to walk on to—meeting these people for the first time in full costume, and Iron Man and Captain America and the whole deal. It was exciting. It’s fair to say there are some pretty big egos on the Avengers. Do we expect to see some of those egos clash when the team starts to get together? HEMSWORTH: Sure. Absolutely. I think that conflict is what makes it interesting. Having seen these people in the individual films, it’s probably pretty safe to say that a lot of the team coming together is having to be about them managing their own egos or each others, and how they fit in. What sort of part they fill. In Thor, the interactions with the human characters made it easier to show you as a god compared to humans. Is any of that interaction here with the superheroes? How does it work? HEMSWORTH: I guess they’re heightened humans. I think it’s probably an easier sell, an easier entry in the sense that he’s not the only one standing in a ridiculous costume. So that’s probably an easier entry. Are they impressed by Thor? HEMSWORTH: I think they are all sort of scratching their heads. There are certainly a few reactions of, “This guy thinks he’s a god? 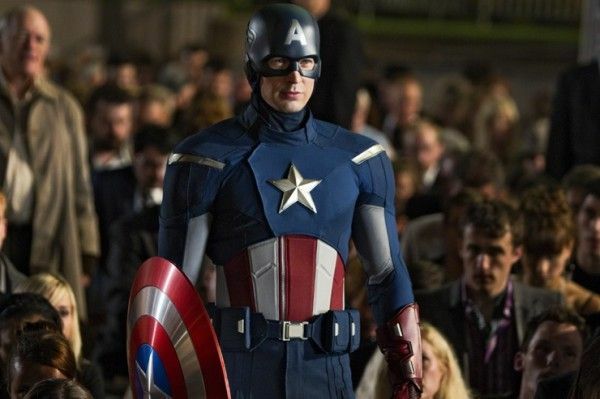 He’s got a cape.” And my reaction to that is, you are wearing a metal suit and you are wrapped in an American flag. I think we all have our odd opinions. Joss [Whedon] has said it before: they are all very lonely characters in a sense because they are… “outcasts” is probably the wrong word. But they’re certainly individuals. And because of that, I think they find, maybe, some comfort in that coming together. As hard as it is at first, they also probably feel at home in some way. Robert is known for working on a scene the day he is going to film it, shaping it, rewriting, doing stuff like that. How has he been on this particular film and have you been able to work as a team on set rewriting stuff? HEMSWORTH: It’s interesting. I heard that as well. I’d never worked with him before. There wasn’t rewriting going on. There was very much what was on the page was what was being said. His interpretation I certainly admire, the way he has such different versions of the same thing. He gets different reactions out of everybody. I talked to him about his preparation and how obsessive he can be at times. He said, “You’ve got to be. You’ve got two weeks beforehand. Drill it, hours and hours and hours on end. That’s how you prepare for a scene.” It’s funny because I find a lot of the time I do that, being new to this business, as a safety net for myself. You look at people like that and think, by this point in their career they must just wake up and half read the lines and do it. But it was nice to hear that he still does that kind of prep and gives it that much attention. Are their love interests in this film? 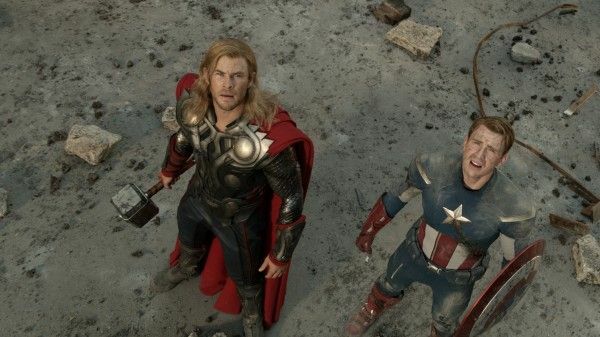 How much of your personal story in Thor carries over to The Avengers? HEMSWORTH: Natalie [Portman] is not in the film, That is no secret. It’s definitely not a love story for Thor. I think it’s certainly taken care of, nicely, that story. There is a nice moment to it to sum up why that’s not his focus at the time. Given how many of you guys have been at the top of the call sheet of a Marvel movie, what is the adaptation process like of being in an ensemble suddenly? HEMSWORTH: For me, I have only really been on the top once. So for me it was, “Oh, I’m back down there again.” Honestly, it’s all felt very evenly spread. We all have a great section in it. It’s not necessarily one person’s story and everyone else supporting them. It really is a good script. For me, I certainly look at Downey as say, the godfather on it, because he started this whole journey. 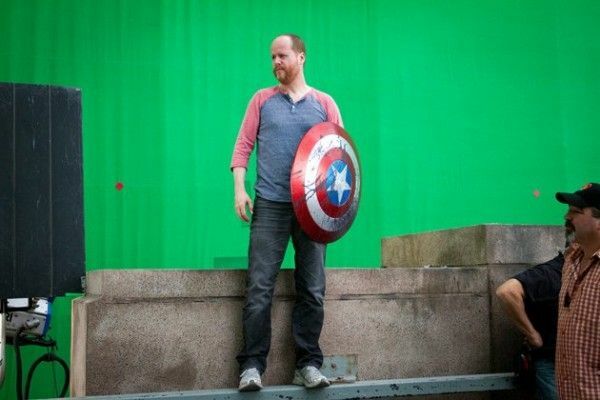 He was the first one to take on the Avengers character, and he is two films ahead of most of us in that sense. Watch and learn. But everyone is proven in their own right, whether they’ve been nominated for Academy Awards or just done a bag full of films over the years. At what point filming your movie, or even afterwards, did you get wind that Loki would be joining you? Did you know that while you were filming last time? Is it tough to keep secrets like that? Even now, you’re always checking to see what you can say. HEMSWORTH: You just become really boring. You end up saying nothing all the time. Like a politician you side step your way out of everything and generalize everything. It would be nice to not have to be secretive and give you some detail. You got to interact with Samuel L. Jackson at the end of Thor. Do we get to see a lot more of that in this movie? HEMSWORTH: Yeah. We have some good stuff. He, obviously in the comic books, is sort of coordinating it all. If there is a problem with the assembly of it all, then you want to go talk to who’s in charge or who started this. I think everyone at one point heads to him. Is there any kind of recognition with Hawkeye when you first see Hawkeye? What does Joss bring to the table as a director that you didn’t experience on Thor with Kenneth [Branagh]? HEMSWORTH: Very different styles. 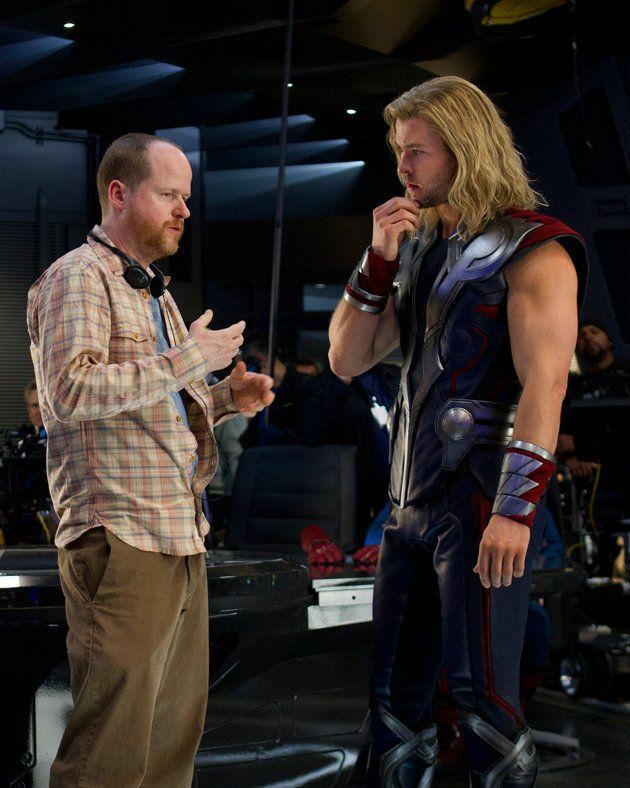 I worked with Joss a couple of years ago [on Cabin in the Woods]. It’s great having a writer as the director because they know the story back to front. And that’s not to say Ken didn’t. Ken knew it as well. But in this instance, I guess having just such a detailed version in his head of what’s happening and what he wants. He knows what he wants. He’s great, he’s got a great sense of humor. Like I said, when you have it on the page, and I really think we do in this, then it makes all the difference. You’re not trying to fix things or band-aid things as you go through it. And if there needs to be something rewritten or tweaked, all of a sudden there he is to do it and have it for you in a second. How much has Marvel laid out for you in terms of future movies. 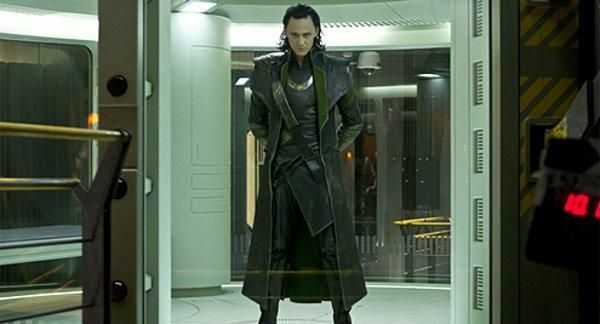 Like the sequel to Thor, have they already started saying to you, “Leave this part of the calendar open”? How much notice do you get on something like that? HEMSWORTH: I think contractually they have to give you a three-month window or four months or something. I think there is some deal, I don’t know the specifics. I know, if they wanted to shoot in, say, December, they have to let you know by August or something. That’s what it says in the fine print, I think. Going back to Loki, are we going to see that same brotherly relationship that you guys had in Thor, or is it going to be more of a general relationship? 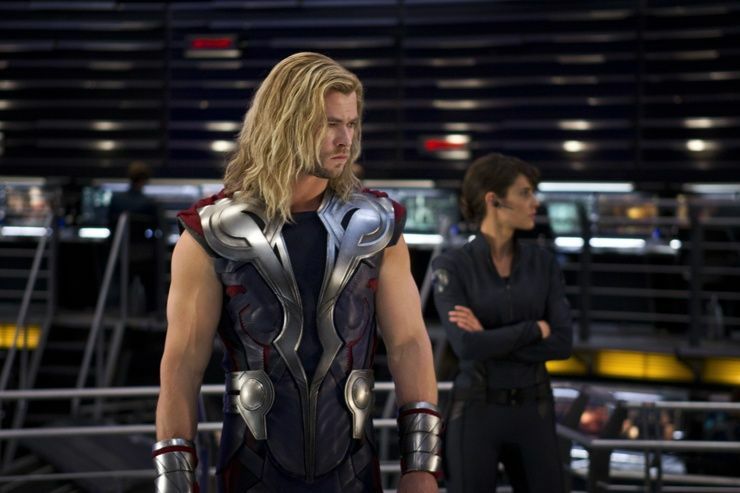 HEMSWORTH: No, it is definitely the brotherly stuff, which has been nice to play with. Thor has a different angle with this. There might be the attitude of, “Let’s just go in there and kill him or beat him up.” Whereas Thor is like, “Wait a second, I’ll do that. It’s my brother.” So there is an interesting dynamic with that. 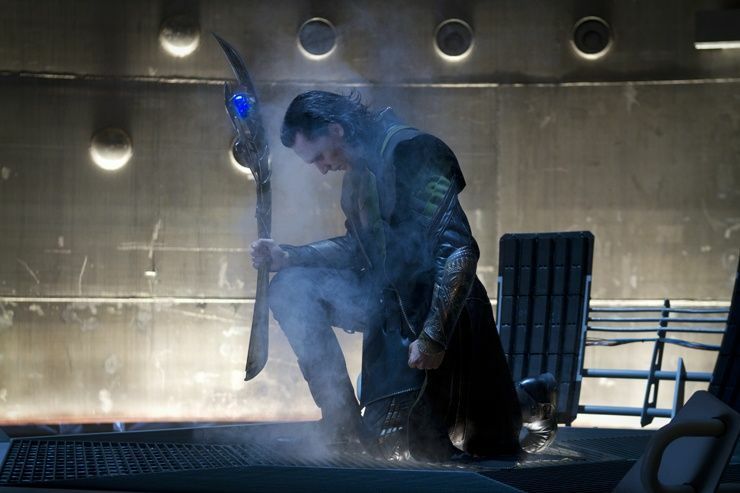 And you know we left Thor, the end of that film, with… Thor really felt upset that he was gone. He wasn’t like, “Yes! I was beating the bad guy.” It was mixed feelings. In the same sense that carries through to here. There’s a lot of questions unanswered for him, why, and how this happened, and what exactly went wrong. That’s been great to play with. I have heard this described as Marvel’s disaster movie. I am wondering if you could talk a little bit about that. HEMSWORTH: As in the world coming to an end? Sure, it is a huge scale of destruction and very negative outcome if the Avengers don’t succeed. So I understand that. Does it feel like you are making a bigger movie? HEMSWORTH: Yeah, it does. I mean, it’s still huge sets as there was on Thor. But I think having a much more scattered schedule makes you go, “Okay, obviously I am not taking care of all of this. There are so many more elements. And it does feel so much bigger than the other film. It does. The amount of sets that I am either on or not, oh my god, there are warehouses full of them. You assume that a lot of this is about the relationship between heroes trying to form a team. Does the actual fighting turn into physical fighting? Or are they already coming together? HEMSWORTH: Oh, no there is some physical tension. There has to be. Do each of the heroes have their own character arc? A subplot in the movie? HEMSWORTH: Yeah, I think they do. They certainly all have a strong motivation for what they want to achieve. You can’t have the same arc you have when it’s solely your movie, just because it would be a seven-hour film. But I think that’s why I am so impressed by what Joss did. He was able to give everyone a strong throughline and motivation for why they were there, and purpose. Is your costume essentially the same one you wore in Thor? Have there been any updates or tweaks? HEMSWORTH: There are some tweaks. It’s certainly more comfortable. We took the last one and said, “Okay, it looked great, but this and this and this was a little difficult.” It’s more comfortable. I think it looks better, too. There is a bit more edge to it. It’s a nice evolution. You guys are part of S.H.I.E.L.D. Are you getting to some kind of uniform between all the heroes? HEMSWORTH: From the comic books, the idea of forming an alliance because of what else is out there and what else exists in the world. I think that’s the goal. I mean as far as the costumes go, do we know you’re members of S.H.I.E.L.D.? 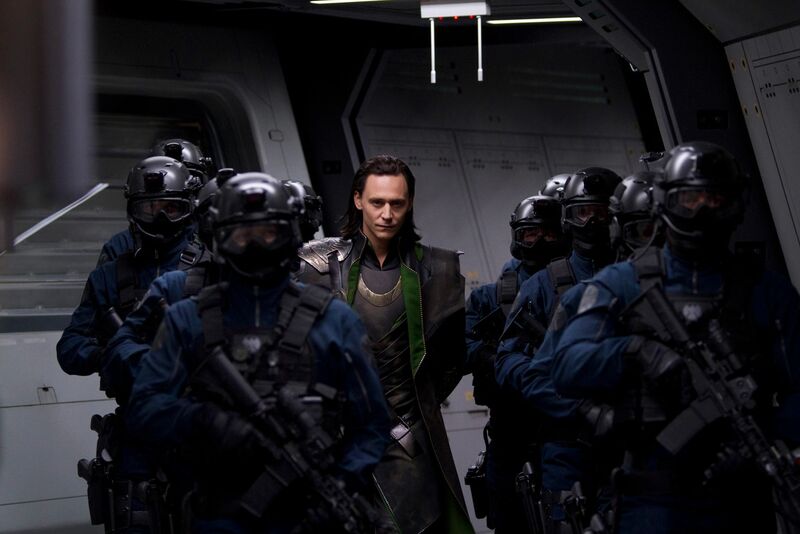 Does Asgard play a factor in this film? HEMSWORTH: It does, I guess. Without giving away what the story is. Well, I can say this, because the tag at the end was about the cube in Thor, too. So that obviously is going to play into this somehow. And that is an Asgardian, otherworldly energy source. So are we back there? HEMSWORTH: We aren’t necessarily back in that world, but it certainly has an influence, sure. Is it explained how Thor gets back to Earth? Because at the end of the film he’s stuck. HEMSWORTH: It is, yep. Rebuilt the bridge. Tony Stark, and Captain America and the gang, do they believe that you are a god? 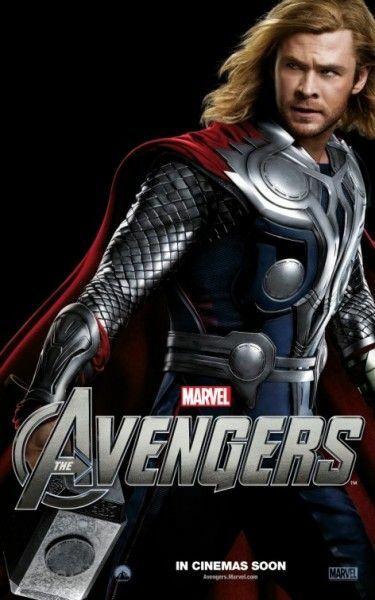 Or is it more the Ultimate version of Thor? HEMSWORTH: It’s a bit of both, I think. They start to see things and go, “I don’t know how many humans can fly.” But I think at first, their reaction is, “What is this? This is ridiculous.” But then again, they also know, that guy can turn green. There are bigger possibilities here. Have you read any comics to get in to the role? HEMSWORTH: Actually, funny enough, I read more of The Avengers, or my introduction to Avengers was when I was working on Cabin in the Woods with Joss. Because Joss and Drew Goddard, when I was auditioning, said “Read this.” They gave me Avengers comics randomly, which is so funny that’s come full circle. Do you remember which ones? I am curious about the hierarchy of S.H.I.E.L.D. Who do you take orders from? Do you except these orders? 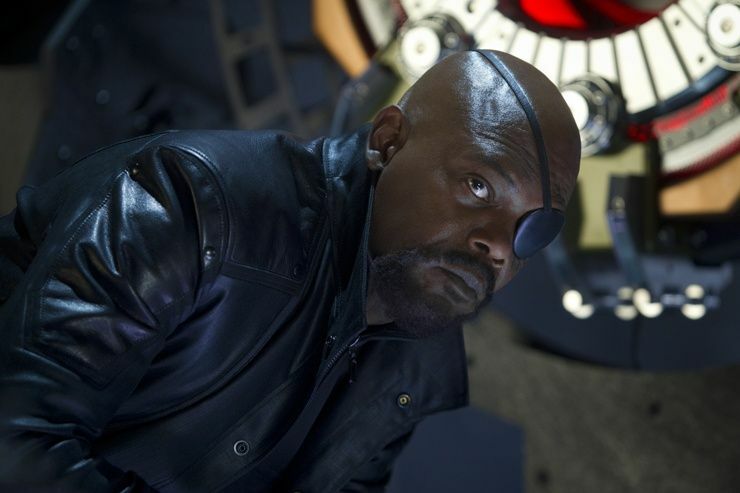 Is Nick Fury in control? Does S.H.I.E.L.D. have some new equipment in this movie? Or some fun toys? HEMSWORTH: Oh yeah, plenty of fun toys. HEMSWORTH: It’s awesome. I don’t know what any of it does. It’s like being on the Star Trek set where I pressing one of the buttons and things would break off. It’s amazing. There is sort of a science-fiction-y thing, but it’s futuristic. Weapons and all sorts of gadgets. Have you got a chance to work with Mark [Ruffalo] as Hulk yet? HEMSWORTH: Not yet, no. I haven’t. Actually, I have done some of the action sequences but he’s not there. There are times when he’s in the jumpsuit with dots on it and what have you. I keep wondering how the hell do they turn that into [the Hulk]? Are they actually using New Mexico like they did in Thor? Does it actually take place in the desert? HEMSWORTH: There are some exteriors. We were somewhere up in the mountains at one stage. And then we go to Cleveland and we had street sets there. But a lot of the stuff here is the studio, in the warehouses. Is it going to actually be in Cleveland? Or is it just going to be a random city? HEMSWORTH: I’m trying to think, I don’t know that I’ve read this in the script. In the comics, it’s New York. And I think that’s what they’re trying to do. 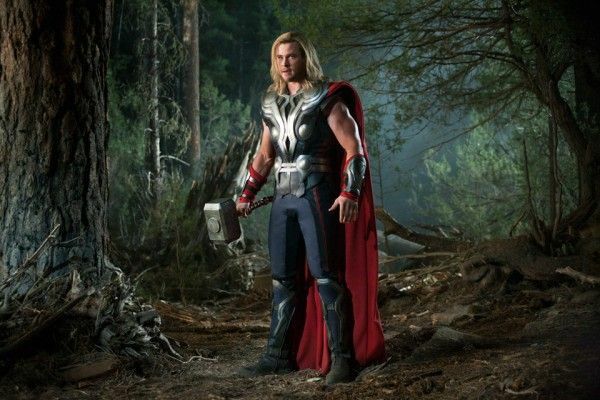 How long was the Thor shoot and how long is this shoot? Can you sort of compare how many days? HEMSWORTH: Thor was about five months. It’s about the same, actually. How would you describe the action set pieces in Thor versus this one? Does this one have a lot more? 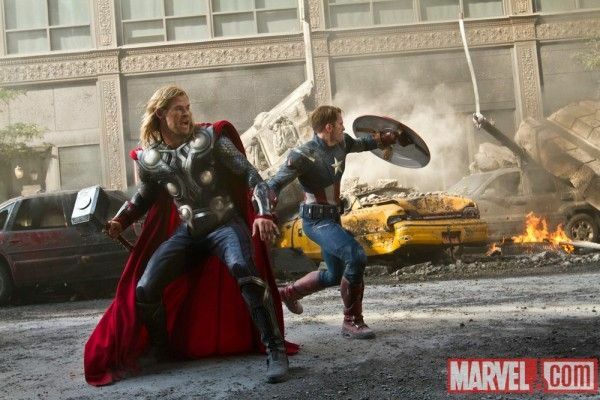 HEMSWORTH: There is probably more in this, just because there are more characters fighting. We can have a couple of scenes of Thor fighting. You’ve got to show each of them in their piece. HEMSWORTH: I think it was just, you know who he is. I really walked into Thor knowing my lines and being at rehearsals. But you kind of go, “Ken where do you want me?” Because I just wasn’t sure what they wanted or how they were going to pull it off. So having done that, it’s certainly easier to go, “This is how he reacts, this is his attitude, this is how he speaks.” So all the things you found there, are definitely easier to pull in. But you also want to have an evolution, and have something new. HEMSWORTH: I planned on taking the hammer on Thor, and sort of missed my opportunity. But it’s not happening this time, I guarantee it. I’ll say it publically, too. The hammer is coming with me. I thought, oh maybe they will give it to me, but that didn’t happen.